The device, called the Sentinel Cerebral Protection System, is the first FDA-cleared device of its kind available in the United States. The Sentinel device, manufactured by Claret Medical, is designed to filter, capture and remove this debris before it reaches the brain. Emory Heart & Vascular Center is among the first in the nation to offer a newly FDA-cleared device to help protect patients from the risk of stroke during minimally invasive aortic valve replacement surgery, known as transcatheter aortic valve replacement (TAVR). The device, called the Sentinel Cerebral Protection System, is the first FDA-cleared device of its kind available in the United States. Studies have shown that during TAVR procedures, and other endovascular procedures, calcium deposits or surrounding tissue can dislodge and travel to the brain, increasing the risk of a stroke. The Sentinel device, manufactured by Claret Medical, is designed to filter, capture and remove this debris before it reaches the brain. It has been shown to reduce strokes by 63 percent during the procedure and in the first 72 hours after it, when most strokes occur. Emory participated in the U.S. clinical trial, published in the Journal of American College of Cardiology, which showed that the Sentinel device captured debris in 99 percent of TAVR cases. "This is a potentially lifesaving device that serves a vital function of filtering out dangerous debris," says Emory principal investigator Vinod H. Thourani, MD, professor of surgery and medicine, Emory University School of Medicine, and co-director of the Emory Structural Heart and Valve Center with Vasilis Babaliaros, MD. Claret Medical is launching the Sentinel device in selected high-volume TAVR centers of excellence across the U.S., including Emory, beginning immediately. "We are pleased to be one of the first centers in the nation to offer this innovative technology to our TAVR patients and continue our ongoing commitment to excellent patient care and superior outcomes," says Thourani. Thourani, Babaliaros and their colleagues at Emory University Hospital, Emory University Hospital Midtown and Emory Saint Joseph's Hospital have performed almost 2,000 TAVR procedures to date and have the largest experience in the southeast US. During the procedure, the Sentinel device is delivered percutaneously via catheter in the radial artery of the right arm before the TAVR procedure begins. 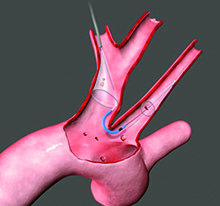 The device's two cone-shaped filters are positioned and deployed in two vessels connecting the heart to the brain - the brachiocephalic artery and the left common carotid artery - where it can begin to trap dislodged debris. After the TAVR procedure, the device and its contents are completely removed from the vessels. Emory Healthcare's comprehensive, cross-functional Structural Heart & Valve Center is a one-stop institution for all types of cardiac valve and defect treatments, from medical management to traditional and minimally invasive surgical care. The Center offers full-service locations at Emory University Hospital, Emory University Hospital Midtown and Emory Saint Joseph's Hospital. For more information on the Sentinel trial at Emory, please call 404-778-7777 or 800-75-EMORY. To learn more about the Sentinel procedure, click here.